When Eli Hershberger, better known as Junior, opened Farmerstown Furniture in 1969, it was the first such business in the area. Not so today when furniture stores dot the landscape around Holmes County, with more opening every year. What began as an antique restoration shop has grown into a family enterprise specializing in new and unique furniture pieces. As of 2002 Junior’s son Merle has run the business with help from his brother Daniel and their father. “My dad started the business with antique restorations and then got into furniture from there; it’s been about twelve years since we totally quit the restoration end of it.” Merle told me. His father acknowledged “It’s a good feeling” to see his sons taking over the business he started. Merle said it would be nice to see his own sons follow in his footsteps as well. Merle and his wife Alma have five children ranging in age from one to thirteen and two of his young sons joined us while we talked. It’s clear family is very important to them and he told me they are preparing for vacation, a few days at a cabin by Lake Erie. “My parents live here in the one house and we live in the other one. My brother and his family live behind us.” He referred to the white-sided, traditional Amish-style homes visible from the store windows. “One thing that makes us very unique is we are strictly family-owned and operated.” He believes this ensures the consistently high quality of their business operation. With five thousand square feet of showroom filled with beautiful, hand-crafted furniture there is plenty to choose from for every room in the house. 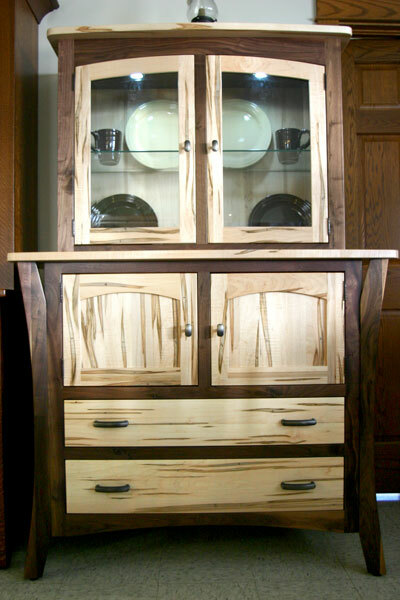 Quarter-sawn oak dining tables, a wormy maple and black walnut home and garden hutch, bedroom sets, and rough sawn, hand-planed rustic cherry tables are just a few of the things on display. As we toured the store, Merle pointed out the wide range of styles including mission, shaker, contemporary, modern, traditional; you name it. Most of the furniture sold here is from local handcrafters although custom items are still made on site. “I tell our customers you will not find a ‘China’ sticker on our furniture.” Merle’s father, Junior, said, referring to the fact that all the furniture they sell is locally made. He laughs, saying he doesn’t think there are any Amish people in China. Farmerstown Furniture also carries a large selection of restoration hardware for cabinets and furniture. If customers are looking for a hardware piece to match something they are building or restoring, Merle will help find it and order it in if it is not already in stock. The basement level is full of “bird” things, this is a branch of the business that Daniel takes care of. On display are a wide variety of feeders including squirrel-proof models, along with a smorgasbord of seeds favored by finches, chickadees, cardinals, woodpeckers, and songbirds of all kinds. I heard chirping which sounded real but I suspected was coming from a mechanized source, also for sale. Bluebird and purple martin houses, bird clocks, books about bugs and birds, puzzles, and even a birdbath are available for purchase. To contact Farmerstown Furniture, please call 330-897-0406.